The Docklands History Group is the leading history group for the study of the Port of London and the tidal River Thames. Among its membership are people with a long-standing interest in port and river-history who have published widely on the subject. If you would like to join the Group, please Click Here to go to Join Us page. The conference for 2019 will be: The Medieval Port of London and will take on Saturday 18th May at the Museum of London.. Please Click Here to take you to the conference page. The Group organises an annual seminar for new researchers. We are currently looking for speakers for our 2019 seminar which will take place in November. The Docklands History Group is now developing a programme of publications. 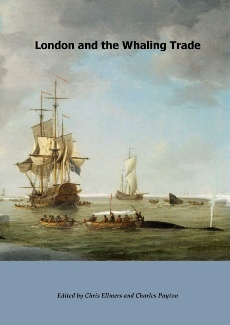 The second of these is: London and the Whaling Trade. Copies of our first publication, The Proceedings of the Fifth Symposium on Shipbuilding on the Thames are also available. For further details on these including how to order and information on other publications please Click Here to go to Publications Page. The Docklands History Group meets on the first Wednesday of each month except January. Other than when there are visits to historic sites, the meetings are usually held at: - The Museum of London Docklands, No.1 Warehouse, West India Quay, Hertsmere Road,, London E14 4AL. At the meeting on Wednesday 1st May the talk will be Lascars in Shadwell 1780-1850 by Dr John Seed, Honorary Research Fellow, Department of Humanities, University of Roehampton. For full details of the activities for the current year, please Click Here to go to Programme of Events. Note: Sometimes you may find some of the pages on this website are not up-to-date. This could be due to the browser you are using. If this happens, press Ctrl F5 on your keyboard which should update the page.